Partners in Prevention is Missouri's higher education substance abuse consortium dedicated to creating healthy and safe college campuses. The coalition is comprised of 21 public and private college and university campuses across the state. Campus judicial officials, law enforcement, and campus prevention professionals are encouraged to take part in both their local coalition efforts and the statewide Partners in Prevention coalition. The unique composition brings together different perspectives on health promotion and prevention efforts. Since the beginning of our coalition 12 years ago, we have focused on preventing high-risk and underage drinking among Missouri's college students and addressing other problematic health behaviors such as high risk driving behaviors and problem gambling. In addition, we also provide support and services to campuses across the state to prevent suicide on campus and support positive mental health among college students. Members of the Partners in Prevention coalition meet monthly for training and network opportunities and host a statewide prevention conference each spring called Meeting of the Minds. Each college and university involved with PIP is required to write and implement a strategic plan for prevention in order to decrease problematic health and safety behaviors on campus and in their community. Funding is provided to each campus affiliated with the PIP coalition. To identify progress of their goals, and to obtain data for program implementation, each campus implements the Missouri College Health Behavior Survey (MCHBS), an annual, online survey implemented each spring semester since 2007. Partners in Prevention’s mission is to create a campus, city, and state environment that supports positive health and safety behaviors by the college students who attend higher education institutions in the state of Missouri. Since 2000, PIP's primary focus is on decreasing at-risk drinking by students on Missouri's college and university campuses. Since its founding, PIP has provided training and networking to its members through monthly meetings, assisted in developing a campus-community coalition on each member campus, annual evaluation of alcohol and drug use behaviors and related consequences, and drive-in workshops and conferences. Each campus in Missouri Partners in Prevention writes an annual strategic plan for prevention, guided by data, to identify those problems and strategies most relevant for their campus communities. In addition to PIP’s work with high risk drinking, Partners in Prevention also provides technical assistance and support to campuses on issues such as underage drinking, suicide prevention and college student mental health, safe driving behaviors, problem gambling, and tobacco cessation and prevention. Partners in Prevention is funded by the Missouri Division of Alcohol and Drug Abuse with additional funding from the Missouri Department of Transportation's Highway Safety Division, the Missouri Department of Mental Health Suicide Prevention Project, SAMSHA’s Garrett Lee Smith Suicide Prevention program, the Missouri Department of Public Safety’s Enforcing Underage Drinking Laws Training Program. To create a campus, city and state environment that supports good decision making in regards to alcohol by the college students who attend the higher education institutions in the State of Missouri. To establish a communication network among the public institutions of higher education in Missouri and state agencies to create effective strategies for addressing the abuse of alcohol and other drugs among Missouri college students. To provide on-going training opportunities for higher education professionals and students on the effective prevention of alcohol and other drug abuse among Missouri college students. To facilitate evaluation efforts including an environmental assessment, needs assessments, establishment of baseline data of students' AOD usage patterns, and measuring the effectiveness of policy changes and program implementation over the grant period. To provide resources that the campuses can access in order to create on-going, creative and effective prevention efforts. An increase in the number of campus/community coalitions throughout the state. An increase in the skill level of those students and professionals who participate in training opportunities. To collect baseline data on students at all participating Missouri colleges and universities. A decrease in availability of alcohol to college students. An increase in the number of alternative, alcohol free programming on the participating campus communities. A decrease in student drinking rates including; binge drinking, average number of drinks per week and number of times students drink per week. A decrease in the negative consequences of binge drinking including violence. An increase in the accuracy of students' perception of their peer's AOD use. In 2009 Partners in Prevention was the recipient of CADCA's 2009 Got Outcomes! Coalition of Excellence Award, winning in the Coalition in Focus category, which recognizes coalitions that demonstrate contributions to communitywide declines for one substance-related issue. In 2008, the National Prevention Network recognized the work of Partners in Prevention with the 2008 National Exemplary Award for Innovative in Substance Abuse Prevention Programs, Practices, and Policies. For more about the National Prevention Network, click here. PIP uses evidence-based programs that yield results, focusing on four approaches to promote healthy decisions with alcohol. The four approaches are prevention education, social norming, harm reduction programs and environmental management. PIP also works with statewide programs that focus on smoking cessation, safe driving, gambling abuse prevention and suicide prevention. We do not recommend that campuses use a single prevention approach, but rather implement a comprehensive plan for prevention which includes multiple approaches. PIP member campuses and the Missouri Department of Transportation are driven to help Missouri's college students Drive Safe Drive Smart. Click here to learn more about DSDS! It is important for people to understand that gambling is not a risk-free activity and that it is becoming increasingly important to learn risk factors, warning signs and strategies to protect yourself or someone you care about. Click here to learn more about gambling! Suicide Prevention Resources is an online network committed to suicide prevention on Missouri's public school campuses. Click here to learn more about our resources! Ask Listen Refer is an online suicide prevention training tool that takes about 20 minutes to complete. The program addresses the need to educate students, faculty, staff, and parents about suicide prevention, and also addresses the need to have suicide prevention resources in an online format. The goal of this program is to educate students, faculty and staff on how to ASK is someone is thinking about suicide, LISTEN to their response and REFER them to a professional. Click here to access Ask Listen Refer! Prescription drug misuse is a quickly growing and largely unaddressed problem concerning college students. With this RX Initiative, we hope to educate students on the dangers of prescription drug misuse as well as provide safe and healthy alternatives. 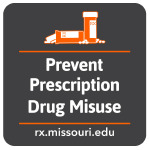 Click here to learn more about Rx drug misuse! I want to participate in your schools survey, but do not think I will be able to collect a list of e-mail addresses and send them to PIP. How can I participate in the survey without giving away my students email addresses? All of our surveys are distributed through CampusLabs and respondents information and data is kept confidential. To view more information about how CampusLabs protects data refer to their website: campuslabs.com/technology. While it is the most preferred method of implementing surveys, PIP can work with your school and CampusLabs so that you may distribute the survey yourself. I have limited time and money to address problematic drinking on my campus. What is the best strategy to reduce drinking on campus? What we have found in Missouri that a comprehensive prevention plan to address drinking is most successful. This includes education, but it expands beyond that to include policy development, enforcement, and adjudication, social norms clarification, harm reduction approaches (designated driver programs, etc), and support for those high risk drinkers (BASICS screening program, etc). Often, we cannot educate the problem away- students need to know what the expectations are from the cues in their environment on campus, etc. I am concerned about the drinking on my campus, but the problem seems overwhelming. Where do I start? Consider implementing a survey to identify the specific problems on campus. You may have a small number of binge drinkers, but since they are binge drinking and experiencing some pretty significant problems, it may seem like a larger problem that it is. If you can identify what percentage drinks, but does not binge, and other key factors, that will help to identify the strategy you choose. National surveys include the Core Survey or the National College Health Assessment from ACHA. All schools in Missouri can participate in the Partners in Prevention Missouri College Health Behavior Survey. Visit national resources, such as the NIAAA report on collegiate drinking, the National Center for Safe and Supportive Schools (who has some higher education prevention resources listed), and the BACCHUS Network, a national peer education organization. Learn more about comprehensive, evidence-based prevention. We have posted a guide for our campuses here. Develop a coalition of key personnel in the campus and community. Talk about the resources above and what the key issues are you want to address (look at survey data if possible) and develop a manageable plan that all can contribute to. Consider moving away from educational approaches focused on scare tactics and into education that focuses on empowering students (bystander intervention approaches, helping students learn about the alcohol they are consuming by teaching about BAC, drink sizes, etc). Give students the tools to make empowered choices. PIP recommends the publication “Why Scare Tactics in Drug Prevention Messaging Don’t Work” from the Drug Free Action Alliance.